used a fake name for Edie, calling her Taxi. The philosophy of Andy Warhol : from A to B and back again. was released, over objections from Dylan's lawyer. 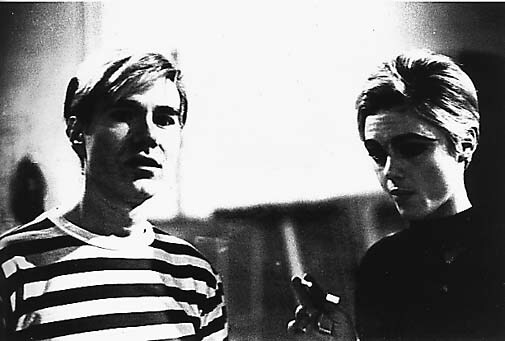 "I first met Edie Sedgwick in 1965 when Andy Warhol was making a film of my play _The Bed_ which had been having a stage-run at Caffe Cino. After a successful screening at the Cinemateque on 41st Street, there followed a quarrel with FuFu Smith, the producer, about who owned the film. Andy put _The Bed_ into his sceret vault though he later spliced portions of it inot _Chelsea Girls_. "During this period I conferred with Andy about writing _The Death of Lupe Velez_ for Edie who was anxious to play the role of the "Mexican Spitfire," found dead in her Hollywood hacienda with her head in a toilet bowl. I met Edie at the Kettle of Fish on MacDougal Street to talk over the project. When I got there Edie was at a table with a fuzzy-haired blond Bob Dylan whose shiny black limousine was parked outside. I mentioned the script I was working on and Edie said innocently, "Oh, we already filmed that this afternoon. It's in the can ... in Technicolor." Nothing more was said when Andy arrived, although he did astonish me that evening by asking, "When do you think Edie will commit suicide? I hope she lets me know so I can film it." "Dylan turned up at the silver factory that same week for a filmed portrait by Andy -- a 15-minute sutdy in stillness, silence, and emptiness. Dylan decided his payment would be a giant Warhol silk-screened canvas of Elvis Presley in cowboy attire firing a revolver. Andy was livid when he saw Dylan taking his "payment" though he opted for cool silence. Mr. Tambourine Man did not sit for nothing." there, for what it's worth. The book is an assembled document, consisting of compiled statements from all sorts of people, some well-known, many not, arranged roughly chronologically. Bob Neuwirth is in it quite a bit; Patti Smith, too. The chronology is hard to figure out (not many dates are given; you have to piece it together from events, etc., if you care that much); this may be a spin-off of the prominence of drugs in many accounts. The overall impression is one of lives wasted, extreme pettiness, and drugs, drugs, drugs. But some pretty crazy fun, too. There are, of course, several references to Dylan. I've copied a couple of the more substantive ones. Thanks to Andrew for reminding me of this book. Paul Morrissey: The Dylan relationship came up one night when we saw Edie at the Ginger Man. It was early in 1966. She told us that she didn't want Andy to show any of her films any more. By that time she'd made about eleven films with Andy in only four months. Then things started to go sour, and her last film before Chelsea Girls was called Lupe, about the acress Lupe Velez, who drowned with her head in a toilet after taking a huge dose of Seconal. Edie had a small role in Chelsea Girls, but she came in later to ask us to take out the section of the film she was in. She told us that she had signed a contract with Bob Dylan's manager, Albert Grossman. It was a very peculiar period. Andy was going through a transition. He was always triying to make more money to support his filmmaking, and he had gotten involved with a new discotheque and was managing a new band, the Velvet Underground. We let them rehearse at the Factory. Suddenly they were taking up more and more time. We started to make little movies with them. They needed a singer, and by accident we ran into this girl named Nico, who had known Dylan in Europe and had been brought over from London by Grossman. He used to come around the Factory with his assistants, supposedly to listen to Nico practice, but for some reason he had lost interest in her. It was Edie Sedgwick he wanted to put under contract. So he'd ask, "Do you have any of those old movies of Edie Sedgwick we've heard about? We'd love to see them." They wanted to wee what she looked like on the screen, but doing it very sneaky and behind our backs. Actually, Edie was all part of it, which we didn't know then. Dylan was calling her up and inviting her out and telling her not to tell Andy or anyone that she was seeing him. He invited her up to Woodstock and he told her that Grossman hoped to put her together with him. She could be his leading lady. So she said to herself, "Ah, this is my break." She signed with Grossman at Dylan's urging. Apparently Grossman had said that he didn't think she should see Andy so much any more because the publicity that came out of it wasn't good. She said, "They're going to make a film, and I'm supposed to star in it with Bobby." Suddenly it was Bobby this and Bobby that, and we realized that she had a crush on him. We thought he'd been leading her on, because just that day Andy had heard in Sy Litvinoff's office -- our lawyer -- that Dylan had been secretly married for a few months -- he married Sara in Nobember,1965. Everything was secret in those days for some reason...al phony secrecy. So Andy couldn't resist asking, "Did you know Edie, that Bob Dylan has gotten married?" She just went pale. "What? I don't believe it! What?" She was trembling. We realized that she really thought of herself as entering a relationship with Dylan...that maybe he hadn't been very truthful. Probably none of it was true -- Dylan never had any intention of making movie with Edie, or starring her. So off she went, and we never really saw very much of her after that. Andy never showed her films any more. He took out her piece of Chelsea Girls and we substituted a little thing with Nico with colored lights going across her face -- an abstract kind of totally minimal film of Nico looking for a half-hour into the camera. It's got some Velvet Underground music with it. It's the last thing in Chelsea Girls, a very beautiful ending. Viva: It must have had an effect on Andy -- Edie leaving him for Dylan, or whoever. He was probably in love with Edie, with all of us -- a sexless kind of love, but he would take up your whole life so that you had no time for any other man. When Edie left with Grossman and Dylan, that was betrayal, and he was furious ...a lover betrayed by his mistress. Nico: After Dino, Edie was very much in love with Patrick Tilden. He was Bob Dylan's best friend. Bob had been staying at the Castle before the Velvet Undergound moved there. Bob's song "Leopard-Skin Pill-Box Hat" is written about Edie. Everybody thought it was about Edie because she sometimes wore leopard. Dylan's a very sarcastic person...It is a very nasty song, whoever the person in it might be. eyelashes. She ordered gin with triple limes. Then a limosine. Patti Smith agreed with you - she wrote a poem about Edie which ended "She was the true heroine of Blonde On Blonde". The songs on Blonde usually linked to Edie are Just Like A Woman and Leopard-Skin Pill-Box Hat. Other songs, such as Absolutely Sweet Marie as you mention, could have Edie connotations too. However, I see Visions as mostly about Joanie, and Sad Eyed Lady Of The Lowlands is unquestionably about Sara. Bob's love-life has always been Tangled Up In Blonde - or any other hair colour :-). Blonde on Blonde cover pictures. Shelley Winters lay dying hoping to check on her condition. Jane, Ingrid Superstar, Gerara Malanga, Pope Ondine, and others. at the New York Times called it a great happening. that the Stones �19th Nervous Breakdown� was all about Edie. best supporting actress nomination in 2007 for her performance. movie �Adam and Steve� to be released on a national basis soon. this very funny gay film.